Disheartening news from the former Red House Museum as reported by The Telegraph and Argus. Supporters of a former museum which was closed down due to budget cuts more than a year ago have reacted with dismay after it emerged that the Council has spent almost £30,000 on the empty building's upkeep in 12 months. Kirklees Council, which owns the Grade II listed 17th-century Red House building in Gomersal, closed the museum's doors to the public in December 2016. But it was not until April last year that the building was fully vacated by the museums service. Erica Amende of Spen Valley Civic Society said it was interesting how much money was being spent on the empty museum and that she feared it would be some time before the Council disposed of it. "With respect to Red House the Civic Society’s view is that its closure continues to dismay local residents. "The Civic Society thinks that it could have been better marketed for its heritage contents and Brontë connections, given the high number of foreign tourists visiting Brontë sites. "A lot of local historical artefacts in the museum are now not accessible to the public, and there has been no information from the Council about that has happened to them, or any alternative strategy for making them accessible to local people in the future." Paul Kemp, service director of economy, regeneration and culture at Kirklees Council, said: “The closure of Red House Museum was part of a plan to transform Kirklees Council’s Museums and Galleries offer so that it could provide improved customer services for 21st century audiences in the context of a reduced budget. The savings from closure of the museum will exceed the costs of securing the building in the short term until it is disposed of. "The guardian scheme is a cost effective, efficient means of security that we have used on many occasions. The guardians act as in house security and our experience is that this greatly reduces the risk of vandalism, break ins and anti-social behaviour. "There is a minimal cost to the council for this scheme as the company which provides the guardians recover the majority of their costs from the fees they charge to the individual guardians." Book Riot suggests literary destinations in Scotland. The Scotsman features the novel The Gallows Pole by Benjamin Myers. Robert Parker, the Halifax solicitor who led the prosecutions against them, is thought by some to have been a possible model for Heathcliff in Wuthering Heights, which Emily Brontë wrote just 10 miles away at Howarth [sic]. In Strange World of the Brontës, Marie Campbell tells a bit more about him and the possible Brontë inspiration. Halifax solicitor Robert Parker has also been likened to Emily Brontë's Heathcliff, for he too rose from obscurity and married a wealthy woman almost twenty years his senior. His wife was Ann Prescott and after their marriage in 1754, Parker went into partnership with her kinsman John Baldwin, a lawyer. Parker quickly rose to become a prominent figure in Halifax. He lent money to Baldwin who defaulted on the debt. Parker took Calico Hall, his debtor's family home in lieu of payment. Robert died a wealthy man but his son Robert Jnr. was a bitter disappointment to him for he was a weakling just as Heathcliff and Isabella's son Linton was. Emily may have heard Parker's story when she was at Law House. 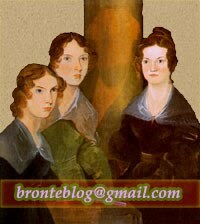 Brontë Babe Blog posts about Jane Austen's juvenilia, comparing it at times with the Brontës'. AnneBrontë.org looks back on the Brontë grandfathers. Rosie Johnson explains how the Brontës find a publisher.